This week we discuss what's really important in life. This topic comes at great self-sacrifice, for I am lactose intolerant. Let's jump right in. 1. What's the best flavor of ice cream? Straight up. 2. What's the craziest flavor you've seen? 3. In a bowl or on a cone? Be specific! WAFFLE OR SUGAR? A. What's the best thing to serve it with? Brownies? Pie? 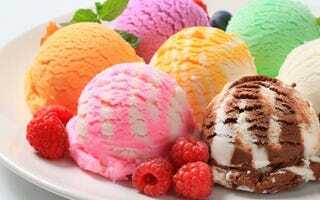 C. SOFT SERVE, HARD, SORBET, OR SHERBERT? I'll just be here, crying.